The invitation is for my daughter's Music Recital. I made them, because it is a huge event in my daughter's life and I wanted to invite all our family and friends. It is also a nice keepsake of the event too. In making the invitation, I was inspired by the color of my daughter's dress in the photo, and the black and white of a music page. I kept the design very simple, with as few layers and no coloring, so that they would be quick and easy to reproduce. The base card is black. The sentiment and the recital information was printed on the computer on to the white card stock. 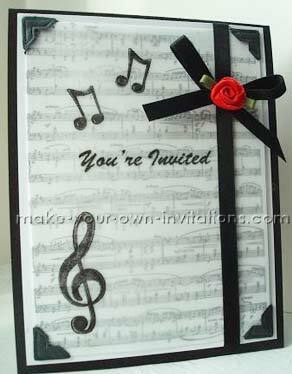 The background of sheet music and other notes are stamps, the sheet music was stamped in black ink onto white card and the music notes were stamped onto the sheet of vellum. If you don't have stamps you can find a music font and use photocopied sheet music instead. The Recital details are stuck to the top inside and a photograph of the recital giver has been adhered to the bottom inside of the card. Return from Music Recital Invitations to see invites.